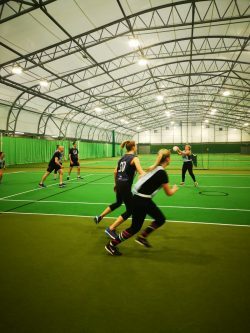 On Tuesday evening, Gilbert Stephens Solicitors formed a team of eight and pivoted from legal matters to shooting nets in a friendly practice match at Exeter University, with financial advisors Brewin Dolphin. 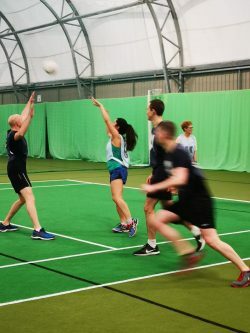 We were inspired to put together a team after being involved in the Brewin Dolphin charity netball tournament last December. At Gilbert Stephens we make a conscious effort to get involved in and arrange local charity events, as part of our commitment to our corporate social responsibilities. This commitment was highlighted with our recent award from the Devon and Somerset Law Society Legal Awards 2019. 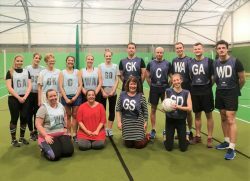 The team was organised by Sarah Heath, one of our Chartered Legal Executives and although we had a great evening, we seemed to have left our feet in the office as we were defeated by 18 goals to 2. Hayley Martin Herkt from Gilbert Stephens Financial Services and Laura Newbould, Legal Secretary, took up the task as our shooters and managed to score one each, but sadly it was not enough to finish victorious. The good news is, we plan many more friendly matches to improve our skills, the evening was a welcome bit of mid-week entertainment and exercise.